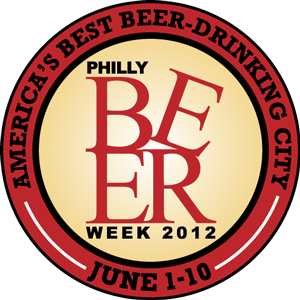 Friday, June 1 is the official start of Philly Beer Week, the largest beer celebration of its kind in the United States. Knowing what events, festivals, dinners, tours or tastings to attend during the ten-day celebration is a daunting task, even for the most ardent Beer Week follower. Last year we created a cheat sheet of events you might enjoy and it became one of our most-read posts. Back by popular demand is 2012’s Philly Beer Week Cheat Sheet. We included an array of breweries, events, neighborhoods and bars to give you a glimpse of everything Beer Week has to offer. Is this every event you should attend? Nope. But, it is a start, especially if you don’t have time to do all your own research. You can find more information on each event on the Philly Beer Week Event Page. If we missed events you recommend let us know in the comment section. You can follow Beer Week on Twitter and like it on Facebook for updates throughout the week. In Search of Beer has a nice rundown of beer dinners to consider, too. Have fun, drink safely and enjoy the best beer celebration in the U.S. You might get lucky and run into a Norwegian brewer. Guided bar crawl through several popular pubs in Center City with an overview of the history of Philly and its beer drinking culture. For $35 it is a fun way to try a bunch of places with a group. Pick a nice weather day to skip work, go get some beer and play shoes with select brewers. June 8 will also have a BBQ going on. Sounds like a good day to me. Headline says it all. When a keg is kicked a new one is brought out. Never a repeat. Your spot if you only pick one place and want to try countless beers. Your chance to taste the many PA-based breweries (roughly 19 at this event), with paired hot dogs. The official kick-off event featuring tastes of beer from more than 30 regional brewers and the ceremonial “first tapping” of PBW 2012 by Mayor Michael Nutter. General admission will begin at 7:30 pm and cost $40 per person. Focus on fruit beers from Fegley’s Brew Works, Lancaster Brewing, Abita, Roy Pitz, RJ Rockers and more. Bike race party in Manayunk and a chance to meet a brewer from Yard’s sounds like fun. Victory and BBQ from Stateside. Sounds like a can’t-miss if you ask me. We just hit up Stateside recently and really liked the vibe at the bar. Good beer and the best cheese in Philly at a hip place. Our local joint and home to our favorite events last year. It’s a really small bar so you’ll have the chance to talk to the brewer. Stick around to 8:30 pm for Oskar Blues and Quizzo. Nice South St. location to meet and chat with owner Jason Lavery. Doobies Bar: Left Hand Brewing and Philadelphia Brewing Co. Missed Doobie’s on Sunday? Here are more chances to meet some brewers. The PBC event was one of our favorites last year – really nice people. Bobo is with Manneken-Brussel Imports, the exclusive U.S. importer of Chimay. Expect several giveaways and prizes. Event in its 5th year. Costs $15.00 and chance to taste 15 homebrewers offering their best. Includes a buffet. Choose this event if it is a nice day and you can sneak out of work because City Tap House has a really cool outdoor deck overlooking UPenn. ‘Cause it just sounds awesome. Impressive list of reps and brewers on hand – in dueling dunk tanks - from Brooklyn, Dogfish, Flying Fish, Nodding Head, Sierra Nevada, Stoudt’s, Weyerbacher and Yards. Proceeds benefit Philly PAWS. Tired of beer already? Make a beer float! Sip some cask ales with Jim Robertson, Brewer from Wells & Young's Brewery in England before embarking on a double decker, open air bus tour of historic Philadelphia. And yes, there will be a firkin on the bus. Call 215-558-2500 for availability. Your chance to check out Philly-based breweries in one spot. We have a soft spot for this brewery after visiting it in Breckenridge, Colorado. Sliders are $1. Hope for nice weather and enjoy Brewvolution No. 1, a 7.6%, 76 IBU Belgian Black IPA, a Philly Beer Week collaboration beer from Prism, Evil Genius and Round Guys. Your chance to meet the 5th generation owner and drink some Yuengling. Sansom St. at UPenn closes down for craft beer served in the street with live music. Excellent Spanish tapas and Stoudt’s. Goose Island has caught the attention of several friends recently so it sounds worth a try. Get your beer and Pink Floyd fix on the big screen at the Piazza. Will feature music from multiple albums and movies. A suburban event in Collegeville. Free show from the popular bluegrass, folk, R&B band. Head to a top German bar for Deutschland favorites and walk away with your own 1L stein. PJ Whelihan's Blue Bell: Turnpike Battle Royale! Another suburban event featuring Free Will Brewing and Full Pint Brewing. Meet Shaun Hill of Hill Farmstead, a Vermont brewer with five beers on Beer Advocate's top 100 list and listed as #6 on RateBeer.com's 2012 list of best brewers in the world! Shaun will be bringing some coveted creations. U.K. Beers and firkens! 10 kegs and at least 5 casks on hand. A craft beer and food festival pairing 75 beers with restaurants in Manayunk. $50 for unlimited beer and food. Johnny Brenda's and Frankford Hall team up for an outdoor beer event with DJ's, dunk tanks and more. 5k run beginning and ending at Dock Street Brewing Company and looping through University City. The Annual Free Dock Street Music Festival follows the run and will feature local music including O'Death and headliner Hoots & Hellmouth. Pre-registration $35, on-site registration $40. Entry to music festival is free. Ex Gratia is a a collaboration between Vetri and Stoudt's Brewery's to benefit Alex's Lemonade Stand. Pay what you want for a glass, $8, $15, $20, whatever. Final judging of coffee-based beers that cannot be stouts or porters. Contest from Philly Beer Scene and One Village Coffee.